You Will Want To Do It Again and..Again ! 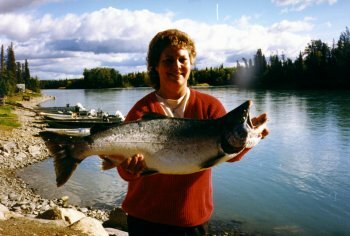 "Faster Action Fishing at Its Finest"
I Could Go Fishing "One More Time"
Silver Salmon Fishing in ALASKA Is Where I'd Be! 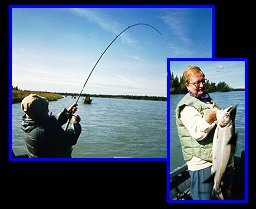 L@@K forward to our "Fastest Action Fishing" ! This Is Your Chance To Experience The "Floatin' Magic Show"
NOW I'm Going To and FEEL It ! "You obviously work very hard at what you do and you are very good at it. A Limit of Silvers & Time For a Great Photo ! Two Moose Calves....."Munchin' Away" ! Tighten The Setscrew On Your Hat ! ACTION "On Top & In Your Face! 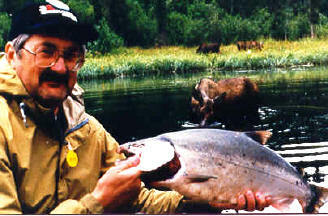 "Best Time ~ Most Fish"
In My Opinion..." Alaska's Finest Fishing"
"Mother Nature" is at her peak. 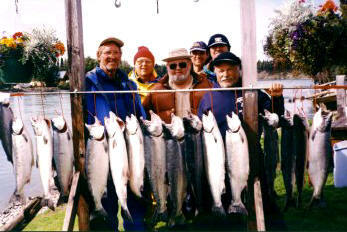 This is "September Silver Fishing" In ALASKA. In September, Enjoying a "More Bountiful Limit"
A Little "Steam" on the "Morning Water"
Want To Start Your Day Like This ? 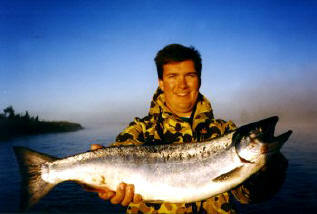 Fish With Us This "Silver Season" ! and.....In August & September.... L@@K Forward To a Lot Of "Good Days" !!! We Can't Take Everyone "Silver Fishing", but We'd Sure Like A Good Shot at You !